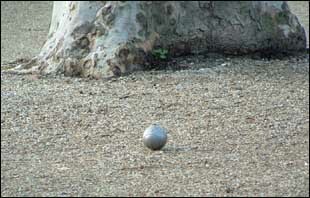 SATURDAY afternoon in Villeréal and it is time for a game of pétanque, the classic French game. The Pétanque Villeréalise ground hosts about forty players, who play in pairs, and with eight games being played at a time it’s a busy pitch. Stood to one side you can hear the dull thud of the boules as they land on the gravel. Or the clack-clack of the steel balls being rolled in the hand, aiding concentration and giving the players a better ‘touch’. This quintessential French sport is simple to understand, but requires great skill to master, simply hurling the ball at the small wooden target is not good enough. First a circle is drawn with the toe as the point where the players stand to launch their boules, with the target ball thrown first. The boule itself is thrown with the back of the hand facing the target and released either high in the air to land and stop quickly. Or there are those players who prefer to adopt a short loop and flatter trajectory that they hope will allow the ball to roll towards its target. Then there are those who will launch a spoiler hoping to knock their opponent’s boule far and wide, this is thrown much quicker and usually lands directly on the opposition! And like any good sport there are players who slam down their remaining boules after launching a bad shot – often with an added expletive for effect. And as the shadows lengthen the players offer words of encouragement to their team mate, or jokes at their opponent’s expense, enjoying their passion for pétanque. To see a selection of photographs, click here. We have guests about 40 weeks of the year, we have a tennis court and a pool... What do they all love to do most? Yes you got it they want to read Le Monde and play boules!